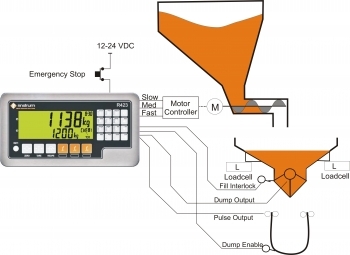 Filling | Standard Weighing Application |ZF Associates Co.
Standard filling applications can be implemented with the 2100 which does two speed filling and supports an optional relay module. In the R400 range the K410 is suitable for three stage filling while the K411 is suitable for more complex filling applications. The K411 supports multiple materials, interlocks and delays for more complex applications. The K410 is for single material filling applications such as dosing, bagging and silo discharge. It uses three set batching stages: fill, dump and a finish stage. For safety there is support for interlocks and enables. For example when the batch interlock is used it must be active for the duration of batching process otherwise the process will halt. Timer based multiple batching that uses the Real Time Clock to control the batch timing for time based batching. The K411 can be used for a range of applications from basic filling through to complex multi stage batching. The predefined applications are an excellent starting point for quick setup of filling applications. The K411 provides extra flexibility for more complex filling applications; it is expandable up to 32 I/O for fill control and interlocks or delays for example. There is thumb wheel support for quick product selection. Batch suspend where a Suspend function key can be set that will pause the batch and adjust the tare weight when resuming the batch.